From Nike’s factory store near the Tulalip Tribes’ Indian Reservation in Washington state to their exclusive design boutique, 21 Mercer, in New York City’s SoHo neighborhood, the N7 collection is winning over the most discerning sneaker consumers. But this hip line of athletic attire isn’t primarily about the footwear. Nike started the N7 program in 2003 to address a major health concern plaguing Native American communities: Type 2 diabetes. From that point on he made it his mission to build the N7 brand on a philosophy of heritage, environmental stewardship, and community health. 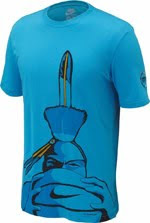 The name of the brand itself is inspired by the Great Law of the Iroquois Confederacy, which states, “In our every deliberation, we must consider the impact of our decisions on the next seven generations.” N7 products are also produced in alignment with Nike’s Considered Design ethos, which seeks to create superior athletic products with a lower environmental impact, and a portion of all sales go to support the N7 Fund, which finances sports-focused programs in tribal communities. An innovator by nature, McCracken not only drafted the initial plan for Native business at Nike, but continues to push the N7 brand to new heights. Most recently he paired Native American multimedia artist Bunky Echo-Hawk (Pawnee/Yakama) with Nike designers to create a signature N7 collection. And, in addition to ensuring that the brand has its own roster of celebrated athlete endorsements, he has made clear that the athletes also have a responsibility to serve as community ambassadors. Boston Red Sox all-star center fielder Jacoby Ellsbury (the first Navajo to play for Major League Baseball) and long-distance runner Alvina Begay (Navajo) are among the brand’s champions.